If you're looking for a great (and cheap!) hotel in Lake Geneva, CheapTickets is the best place to find them. We offer deals on the best 180 hotels throughout Lake Geneva. No matter what you're looking for, we have options for you. Grab great rates on the 43 affordable 3-star hotels that are easy on the wallet without sacrificing comfort. Looking for more luxury? Try one of the 3, 4-star hotel accommodations in Lake Geneva. No matter your budget needs, we've pulled out all the stops to make sure you have plenty of vacation options. Maybe you prefer to search for your hotel deals based on what each hotel offers? For example, let's say you just want to find a hotel or resort that has a pool to cool off in after a long day exploring Lake Geneva. Scroll down to choose from the 126 hotels in Lake Geneva that has a pool for guests. Or search for deals on Lake Geneva hotels offering free wifi or breakfast, non-smoking rooms, and more! CheapTickets is here to be your personal travel agent for your next trip to Lake Geneva. Get booking today! What hotels in Lake Geneva offer free wifi access? Are there deals on Lake Geneva hotels offering free breakfast? Yes! The only thing better than finding a great deal on a cheap hotel in Lake Geneva is finding one that offers free breakfast. Grab some eggs, a waffle, or some healthy oatmeal before a day full of exploring Lake Geneva and all that it has to offer. Below are just some of the many hotels that offer free breakfast in Lake Geneva. 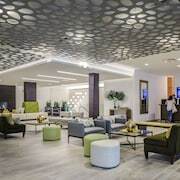 SpringHill Suites by Marriott Chicago Waukegan/Gurnee is a 3.00 star rated hotel property in Lake Geneva that offers free breakfast. Best Western Executive Inn is a 2.50 star rated hotel property in Lake Geneva that offers free breakfast. Quality Inn Sturtevant - Racine is a 2.50 star rated hotel property in Lake Geneva that offers free breakfast. 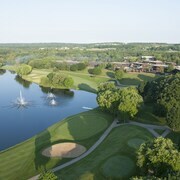 Marriott Milwaukee West is a 3.50 star rated hotel property in Lake Geneva that offers free breakfast. What about deals on pet-friendly hotels in Lake Geneva? Lake Geneva is a great place to get outside and explore with your pets in tow so don't leave your furry friends behind. Below you'll find great deals on hotels in Lake Geneva that allow pets. Don't forget to bring plenty of treats! Baymont by Wyndham Waukesha is a popular, pet-friendly, 2.00 star hotel in Lake Geneva. Super 8 by Wyndham Waukesha is a popular, pet-friendly, 2.00 star hotel in Lake Geneva. 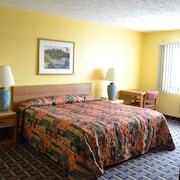 Quality Inn Milwaukee/Brookfield is a popular, pet-friendly, 2.50 star hotel in Lake Geneva. Embassy Suites by Hilton Milwaukee Brookfield is a popular, pet-friendly, 3.50 star hotel in Lake Geneva. Any good rates on Lake Geneva hotels with restaurants? Absolutely. Don't want to deal with planning our all your meals on your trip to Lake Geneva? We don't blame you. Keep the hangry away by staying in one of the 42 hotels that have restaurants. With a room at one of these spots, all it takes to get a good meal is hopping in the elevator. 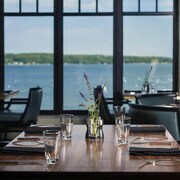 Check out some of the most popular hotels in Lake Geneva that have restaurants below. Book The Cove Of Lake GenevaThe Cove Of Lake Geneva is a 3.50 star hotel and has one or more restaurant options. Book Harbor Shores on Lake GenevaHarbor Shores on Lake Geneva is a 2.50 star hotel and has one or more restaurant options. Book Hilton Garden Inn OconomowocHilton Garden Inn Oconomowoc is a 3.00 star hotel and has one or more restaurant options. 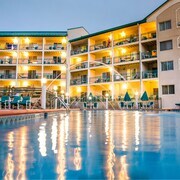 Book KeyLime Cove Indoor Waterpark ResortKeyLime Cove Indoor Waterpark Resort is a 3.00 star hotel and has one or more restaurant options. What are the cheapest hotels in Lake Geneva with pools? What's better after a long day exploring Lake Geneva then a relaxing dip in a pool? Finding the Lake Geneva hotel you need for a bargain! Cool off and unwind at one of our 126 Lake Geneva hotels with a pool. Browse some of the top deals on these hotels and resorts with pools in Lake Geneva below, but be warned: You may not want to check out! La Quinta Inn Milwaukee Airport/Oak Creek has a pool and a 2.50 star rating. 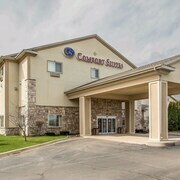 Country Inn & Suites by Radisson- Kenosha- WI has a pool and a 2.50 star rating. Holiday Inn Gurnee Convention Center has a pool and a 3.00 star rating. Extended Stay America Chicago - Gurnee has a pool and a 2.50 star rating. What hotels in Lake Geneva offer parking for guests? Once you've made your way to Lake Geneva, the last thing you want to deal with is finding parking close to your hotel. Avoid the hassle of parking around the block and carrying your luggage all the way to the lobby by booking one of our hotels with parking. Check out deals on some of the 141 hotels in Lake Geneva that offer parking for guests. Comfort Inn & Suites This hotel has a 2.50-star rating. Motel 6 Libertyville IL This hotel has a 2.00-star rating. Best Western Waukesha Grand This hotel has a 2.50-star rating. Fairfield Inn Racine This hotel has a 2.50-star rating. Do Lake Geneva hotels offer 24-hour concierge services? When you're on vacation, things don't always go according to plan. Travel with peace of mind when you book one of our 23 hotels in Lake Geneva with 24-hour concierge service. That way you know help is always phone call or elevator ride away. Try Timber Ridge Lodge and Waterpark. It's a 3.50 star rated hotel in Lake Geneva that offers concierge services 24 hours a day. 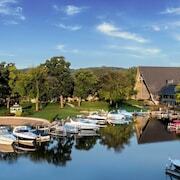 Try Grand Geneva Resort & Spa. It's a 4.00 star rated hotel in Lake Geneva that offers concierge services 24 hours a day. Try The Cove Of Lake Geneva. It's a 3.50 star rated hotel in Lake Geneva that offers concierge services 24 hours a day. Try Holiday Inn Gurnee Convention Center. It's a 3.00 star rated hotel in Lake Geneva that offers concierge services 24 hours a day. What about low rates on non-smoking hotels in Lake Geneva? Extended Stay America Milwaukee - Waukesha This hotel has a 2.50-star rating. Wyndham Garden Kenosha Harborside This hotel has a 3.50-star rating. Ramada by Wyndham Waukegan/Great Lakes This hotel has a 3.00-star rating. Baymont by Wyndham Gurnee This hotel has a 2.50-star rating. What are the cheapest Lake Geneva 3-star hotel deals? Our 3-star hotels bring you quality accommodations at a lower price point for the perfect, budget-friendly vacation in Lake Geneva. With 43 3-star hotels throughout Lake Geneva to choose from, you still have options. Browse our selection below. The Cove Of Lake Geneva. 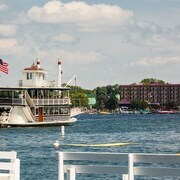 This family-friendly Lake Geneva hotel is located in the business district, within a 5-minute walk of Riviera Ballroom and Lake Geneva Cruise Line. Paradise Golf Park and Riviera Beach are also within 10 minutes. KeyLime Cove Indoor Waterpark Resort. This family-friendly Gurnee hotel is located in the entertainment district, within 2 mi (3 km) of Six Flags Great America and Gurnee Mills. Gold Pyramid House is 2.1 mi (3.4 km) away. Ramada by Wyndham Waukegan/Great Lakes. Situated in Waukegan, this hotel is within 3 mi (5 km) of Visual Arts Center, Genesee Theater, and Waukegan Harbor. Six Flags Great America and Bonnie Brook Golf Course are also within 6 mi (10 km). Timber Ridge Lodge and Waterpark. Located near the slopes, this Lake Geneva condominium resort is within a 15-minute walk of The Brute Golf Course and The Highlands Golf Course and close to winter sports such as cross-country skiing and snowshoeing. Mountain Top at Grand Geneva and Dan Patch Stables are also within 2 mi (3 km). What are the best deals on 4-Star Hotels in Lake Geneva? Lake Geneva is full of hotels and it can be hard to narrow down where you really want to stay. Luckily, we've done that hard work for you be narrowing you from 180 hotels throughout Lake Geneva, to the 3 4-star hotels in Lake Geneva. Our 4-star hotels in Lake Geneva are exactly what you need for your next family trip, romantic weekend, or solo getaway. Check out our most popular deals below. Grand Geneva Resort & Spa: Located near the slopes, this Lake Geneva resort is within a 5-minute walk of The Brute Golf Course and The Highlands Golf Course and close to winter sports such as snowmobiling. Mountain Top at Grand Geneva and Dan Patch Stables are also within 2 mi (3 km). Bedbugs!! Freezing pool. Dirty top to bottom especially bottom of pool. One night stay and I'm covered in bedbug bites. Great view of Lake Geneva, right across the street. Location ideal for shopping on Main St, restaurants and boarding the boat cruises. Clean and very friendly staff. Grand Geneva is beautiful! The resort is first-class. The room is modern and updated with nice decorating and new furniture. I will go back. Staff is friendly and helpful. Thank you. Clean and we'll kept hotel. Pool was nice but it was pretty chilly in there. Breakfast wasn't fancy, no hot food, but still good. Owners are very nice and helpful. I would go back. Seven Oaks was a great experience! We were in the St Albans unit, which was a great unit. It had a jacuzzi, heated bathroom floors, wonderfully furnished, wine and cheese, & continental breakfast. The staff were very nice, accommodating, and helpful with directions. 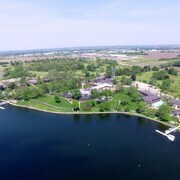 The location was great too....only a couple blocks off of the lake and downtown, which made it very nice to get around and not have to find & pay for parking.